While the soon-to-be 74 year old Paul McCartney may not have to worry if he will be fed, for many at 64, the options may not be so bright. 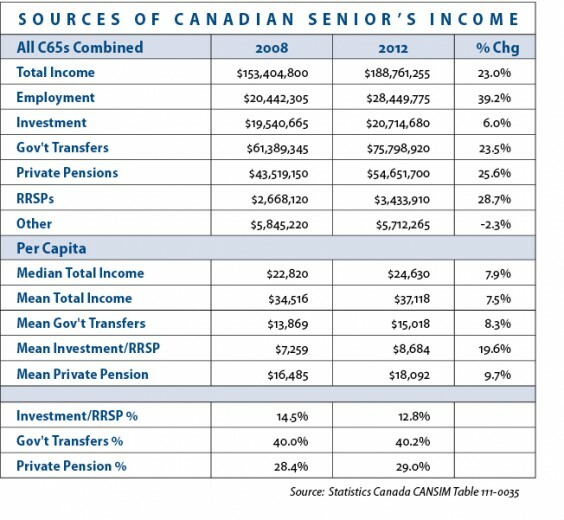 In this issue of Market Perspectives, we look at the income composition of Canadians 65 and older (C65s). The table below summarizes income sources for the C65 cohort, comparing 2012 (most recent data) to 2008. While C65 total income rose by 23%, it is simply because the cohort grew by 14%. Per capita income (median and mean) grew by less than 8%, barely matching the CPI. C65s are increasingly turning to employment for income needs. Employment income grew by 39% and the number of C65s working grew by 30%. Also telling is the paltry growth in investment income (dividends and interest), which only grew by 6%. Financial oppression, the continued policy of governments to stimulate the global economy though low interest rates, is undoubtedly hurting C65s. For additional articles, visit our Blog.